Why would you want to quit shampoo? Well, there are plenty of people who will tell you that the chemicals in shampoo like methylisothiazolinone and diethanolamine can give you terrifying health problems like nerve damage and Alzheimer’s disease. But those people are probably not correct; while it might not be good to literally bathe in that stuff, the small amounts in shampoo likely will not hurt you. What is true is that certain chemicals in shampoo, especially foaming agents like sodium lauryl sulfate (SLS, for short), can irritate your scalp and hair, as well as the skin that your hair touches, meaning you and your hair don’t look as healthy as you could. So, let’s review: quitting shampoo will clear up your complexion and make your hair look awesome, plus it will save you time and money. Also it’s better for the environment to use fewer plastic bottles and wash less poison down the drain. And there’s I guess a tiny chance it will also save you from some combination of cancer and let’s go with…epilepsy. Ready to give it a try? -To make your new “shampoo,” slowly add water to baking soda until it’s just slightly gooey. You can make as much or as little as you like to start. The exact proportions aren’t really that important, but it’s best to err on the side of adding too little water. Once you’ve got it to a consistency you like, store it one of those little travel bottles or a jar and keep it handy in your shower. -Next, make the “conditioner.” Add 1–2 tablespoons of apple cider vinegar — NOT white vinegar — to about a cup of water. Again, the measurements don’t have to be precise, but in this case, it’s better to have to little vinegar than too much. Store this in your shower as well. -Now it’s time to implement your new hair-washing routine. First, rub the baking soda all over your wet hair, particularly into the roots. Scrub it in there the best you can, let it sit for one minute, and then rinse your hair thoroughly. Next, pour the vinegar conditioner on your hair, rub it in, this time paying more attention to the ends of your hair than the roots, and then rinse. At this point, all you need do is massage your scalp under running water in the shower. You can gradually taper off the baking soda or just go cold turkey. Your hair will become quite greasy, but only for a little while. For me, Peak Grease was reached on Day 4. On that day, I was obliged to go to my boyfriend’s band’s performance at a gallery show featuring paintings of naked men. I wore a hat. But so okay: shampoo strips your hair of its natural oils, which makes your scalp overproduce more oil to compensate. 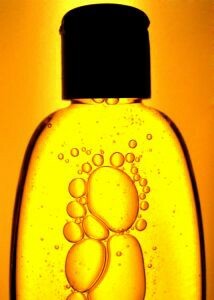 After you stop shampooing, it takes some time for your scalp to recalibrate and reduce oil production. But don’t worry, after about a week without shampoo, your hair will get closer to reaching its natural balance, and you’ll no longer look like you’re in the throes of puberty. After the first week, you’ll still have a little more waiting it out to do. Your hair will continue to be greasier than usual for four or five weeks. If you have bangs, ask yourself this: is it a cute, sassy style to have grease all over your forehead for a month and get a bad breakout and have sticky little shreds of hair instead of bangs? If your answer is no, then pin your bangs back for the time being. Aside from that, your hair might look a little dirty, but probably no one else will notice. One of the biggest sacrifices you’ll have to make during this whole process is that you can’t use any mousse, gel, or other styling product during this stage, because they’ll mess up the whole “hair finding its natural balance of oils” deal. If you’re hella stressing, you can put a tiny bit of baking soda along your part and comb it into your hair to absorb excess grease, but seriously, after the first week, no one will think you look weird unless you’re just a weird-looking person generally. After you’ve gotten through the waiting game, you’ll be looking lovely and your hair will be perfect and soft. Now all you need to maintain that healthy glow is to wash once a week with baking soda and vinegar. That should be enough to keep your hair clean now that it isn’t constantly overcompensating. Depending on your hair, you might want to bump it up to twice a week or down to once every ten days. If you still need styling products, go for SLS-free stuff from brands like Aubrey Organics or Suncoat. No commercial products are going to be completely “natural” (whatever that even means), but the fewer polysyllabic chemical names on the label, the better. For hippie bonus points, make your own hair products at home from ingredients like flaxseed and lemon juice. (Google has plenty of recipes.) There’s a good chance you won’t even need any product at all, though. The only thing I use is a dryer with a finger diffuser, and my hair usually stays curly or at least wavy until I get in the shower again. See it doesn’t seem so bad, does it? Just think how good you’ll feel about all the money you’ve saved, all the chemicals you’ve avoided — not to mention how you single-handedly rescued Mother Nature. So go on and get rid of poo, in your hair and in your life! Lauren O’Neal grew up near Berkeley, California, but didn’t become a dirty hippie until after moving to Texas.